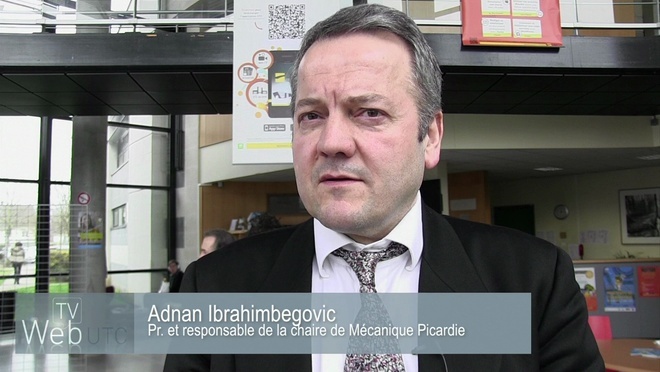 The Chair for "PICARDie digitized mechanical engineering” arose through conclusions drawn in a strategic reflection about the future mechanical engineering inasmuch as it enables the actors to throw light on one of Picardie’s mainstay sectors and which also constitutes a prominent research theme at UTC. It was indeed in UTC’s desire to structure its offer in mechanical engineering and to acquire jobs and means to respond favourably to the challenges facing the industrial partners. Among these challenges we have the global economy that generates strong competition, for which the only solution in the long terms is continuous innovations of products and services. The Chair for "PICARDie digitized mechanical engineering" represents a channel for UTC to express its strategic vision and interconnects 3 missions inherent to Mechanical Engineering: Training, Research and Innovation. The UTC-Roberval Laboratory (Mechanical Engineering) is the main actor, with some 50 research scientists/lecturers and the Chair will help consolidate their inter-team activities, increase visibility and enhance international recognition. It will also enable an extension of the scope of training offered and to develop new industrial partnerships. Multi-scale questions, which are omnipresent in material analysis (for heterogeneous forms). For example, when we seek to define relevant predictive models for hot corrosion (a factor that affects the life expectancy for materials used in the nuclear sector, for automobile manifold, exhaust pipes and mufflers), you need to be able to analyse material behaviour at varying scales, from networks to single atoms. Shock, impact or fast dynamic behaviours. Analysis is used here to study the life expectancy of welded parts in car frames, or for composites used in aeronautical construction or in the railroad sectors. Approaches to mechanical failure questions, calling for digital modelling to study faults, from start through propagation up to final part failure and material breaks. Resolving multi-physical problems, such as the antagonistic form of several parts in a product design protocol. For example, lightening vehicle (mass shaving) is often contradictory to noise insulation and resistance of the vehicle to crash situations. Moreover, the Chair will make it possible to share the wide range of skills possessed by the UTC Roberval laboratory, recognized as a pole of competence in the design of electronic control actuators. It will extend its research and its partnerships associating questions of safety measures, lightening of structures and energy storage. It can thereby prepare and provide answers in the Picardie Region to the challenges and problems raised by function-intensive materials, those of the vehicles for tomorrow and energy production, notably using wind turbines. Again, the Chair will call on contributions from other research facilities, in which the UTC Roberval Laboratories is strongly engaged: the MS2T Labex (control of technology-intensive systems of systems) for this theme and management of uncertainty and variability and for the Railenium IRT concerning modelling questions in regard to rail wear and development of software packages specific to needs of the railroad sector. The Chair receives financial support from UTC, the Picardie Regional authorities and the EU Regional Development Fund (FEDER) for an operational budget set at 150 k€/yr. The Chair has been planned for an initial 3 years period and, of course, will be able to seek other external financial contributions from the socio-industrial world. In the long term, an international level research training course will be proposed, including work with UTC partners at the German university of technology at TU Braunschweig, the Finnish UT Tampere and also in France University of Paris 6 (Pierre & Mari Curie) in the framework of the Sorbonne Universities IDEX.